Let there be no mistake about it, 9/11 was a horrific event. The media coverage shot around the world meant that people everywhere were in the know for better and for worse. Even those who were on the other side of the globe were psychologically traumatised by the disturbing images. Everyone is marked by this defining moment with "I remember where I was when..."
At the 10th anniversary of this tragedy, commentators, pundits and journalists have turned their attention to analyzing and assessing all that transpired before and after. Why did it happen in the first place? Has enough been done to ensure it will never happen again? Donald Rumsfeld (born 1932) has the twin distinction of having been the youngest and oldest person to have served as Secretary of Defense. At the age of 43, he was the 13th Secretary of Defense from 1975 to 1977 under President Gerald Ford, and then at the age of 74 was the 21st Secretary of Defense from 2001 to 2006 under President George W. Bush. According to Wikipedia, Rumsfeld was sworn in shortly after Bush took office on January 20, 2001 because Bush's first choice, FedEx founder Fred Smith, was unavailable. In a Sept. 11 interview, Mr. Rumsfeld told CNN’s Fareed Zakaria that the Iraq war was worthwhile, despite the absence of Baghdad’s involvement with al-Qaeda and its alleged arsenals of weapons of mass destruction. “I think the world is certainly a better place with Saddam Hussein gone,” Mr. Rumsfeld said. Okay. But what about any number of despots or dictators elsewhere in the world? North Korea's Kim Jong il? Libya's Muammar Gaddafi? Egypt's Hosni Mubarak? Syria's Bashar al-Assad? Yemen's Ali Abdullah Saleh? The War in Iraq started on March 20, 2003. All U.S. forces are scheduled to be out of Iraq by December 31, 2011. (Wikipedia) That is eight years, nine months and eleven days. The U.S. launched a global War on Terror in the wake of the 9/11 terror attacks on the World Trade Center and the Pentagon, the most deadly strikes against domestic targets by foreigners in U.S. history. Beyond the incalculable human cost of nearly 3,000 civilian deaths, and the subsequent deaths of over 6,000 soldiers, 2,300 contractors and hundreds of thousands of Afghan and Iraqi soldiers, policemen and civilians, the fateful choices made after the attacks had profound ramifications for the U.S. government and continues to be a major contributor to its fiscal woes. If one includes both the next decade’s interest payments on the debt-financed wars and future veterans’ benefits, the total cost of the wars in Iraq and Afghanistan is now estimated to reach more than $5 trillion. Secretary Rumsfeld Remarks on ABC "This Week with George Stephanopoulos"
Key goal of the military campaign is finding those weapons of mass destruction. None have been found yet. There was a raid on the Answar Al-Islam Camp up in the north last night. A lot of people expected to find ricin there. None was found. How big of a problem is that? And is it curious to you that given how much control U.S. and coalition forces now have in the country, they haven't found any weapons of mass destruction? Not at all. If you think -- let me take that, both pieces -- the area in the south and the west and the north that coalition forces control is substantial. It happens not to be the area where weapons of mass destruction were dispersed. We know where they are. They're in the area around Tikrit and Baghdad and east, west, south and north somewhat. "It turned out, as we discovered later, that a lot of sources that had been attested to by the intelligence community were wrong," Powell said in Washington, DC. "I understood the consequences of that failure and, as I said, I deeply regret that the information - some of the information, not all of it - was wrong," said the former chairman of the Joint Chiefs of Staff. "It has blotted my record, but - you know - there's nothing I can do to change that blot. All I can say is that I gave it the best analysis that I could." Rumsfeld served from November 1983 to May 1984 as Special Envoy to the Middle East for Ronald Reagan. 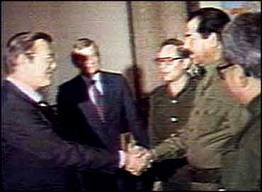 He visited Baghdad on December 19 - 20, 1983 and had a 90 minute meeting with Saddam Hussein. This was in the middle of the Iran-Iraq War (Sep 1980 - Aug 1988) during which over a half a million people, soldiers and civilians were killed. After the U.S. invasion of Iraq in 2003, there was a great deal of lawlessness. The U.S. was criticized for not doing more to protect historical artefacts and treasures plus museums and other cultural institutions. [T]here are known knowns; there are things we know we know. We also know there are known unknowns; that is to say we know there are some things we do not know. But there are also unknown unknowns -- the ones we don't know we don't know. The above statement was made by Rumsfeld on February 12, 2002 at a press briefing where he addressed the absence of evidence linking the government of Iraq with the supply of weapons of mass destruction to terrorist groups. 9/11 was a tragedy. Justice was demanded and whether we will admit it or not, revenge was a glint in our eyes. However, in the wake of the event, any criticism of the Bush administration was tantamount to treason and was the need to do something, anything at all, a factor in blinding our leaders and possibly blinding all of us as to what happened, why it happened and what was the best course of action afterwards? Human beings can be resilient, brave, hard-working and self-sacrificing when presented with a cause. However, our leaders are not gods; they are mere mortals subject to same emotions of revenge, short-sightedness and pride as we are. They can just as well make a bad decision as we can. Unfortunately, their bad decision involves more zeros, a lot more zeros. 10 years after 9/11, the papers are filled with articles questioning what has happened after the event, the decisions that were made and the actions carried out trying to determine if we are better off than we were. Whatever the case, at the end of the day, at the end of this decade, what has happened is so big, so unbelievably huge, "it just is". We are obliged to contend with the current state of affairs. We can't change anything; we must deal with what is. The old saying is that history repeats itself. Will we learn anything? Knowing what we know now, would we collectively spend $5 trillion to topple Saddam? What about Gaddafi? Or Kim Jong il? Would we spend $5 trillion to go after a single man and his extremist ideology? We will all be discussing this from here to eternity trying to determine the truth and playing What if? scenarios. There will be no "right" answer. However, if you had $5 trillion, what would you do to make the world a better place? Donald Henry Rumsfeld (born July 9, 1932) is an American politician and businessman. As a government official, Rumsfeld served as the 13th Secretary of Defense from 1975 to 1977, under President Gerald Ford, and as the 21st Secretary of Defense from 2001 to 2006, under President George W. Bush. He is both the youngest (at 43 years old) and the oldest person (at 74 years old) to have served as Secretary of Defense. In the last four budget years of President Clinton’s term in office (fiscal years 1998 through 2001), the U.S. ran a $559.3 billion surplus. In the succeeding eight years (fiscal years 2002 through 2009), the U.S. ran a $3.5 trillion deficit. Even if one excludes the $1.4 trillion deficit of 2009, when the economy was in freefall from the financial crisis, the Bush administration racked up over $2 trillion in deficits despite unemployment falling below 5 percent thanks to the housing bubble. A young African American Illinois state senator made a similar argument at a rally organized by Chicagoans Against War in Iraq in October 2002. Barack Obama had supported the war in Afghanistan, but he predicted that “even a successful war against Iraq will require a US occupation of undetermined length, at undetermined cost, with undetermined consequences. I know that an invasion of Iraq without a clear rationale and without strong international support will only fan the flames of the Middle East and encourage the worst, rather than best, impulses of the Arab world, and strengthen the recruitment arm of Al Qaeda." "When the Bush administration went to war in Iraq it obviously didn't focus very much on the cost. Larry Lindsey, the chief economic adviser, said the cost was going to be between $US100billion and $US200 billion - and for that slight moment of quasi-honesty he was fired. "(Then defence secretary Donald) Rumsfeld responded and said 'baloney', and the number the administration came up with was $US50 to $US60 billion. We have calculated that the cost was more like $US3 trillion. "Three trillion is a very conservative number, the true costs are likely to be much larger than that." Lawrence B. Lindsey was director of the National Economic Council (2001–2002)... He left the White House in December 2002 and was replaced by Stephen Friedman after he estimated the cost of the Iraq war could reach $200 billion. On September 15, 2002, in an interview with the Wall Street Journal, Lindsey estimated the high limit on the cost of the Bush administration's plan in 2002 of invasion and regime change in Iraq to be 1-2% of GNP, or about $100–$200 billion. Mitch Daniels, Director of the Office of Management and Budget, subsequently discounted this estimate as "very, very high" and stated that the costs would be between $50–$60 billion. This lower figure was endorsed by Defense Secretary Donald Rumsfeld who called Lindsey's estimate "baloney". The Three Trillion Dollar War is a 2008 book by Nobel Prize laureate Joseph Stiglitz and Harvard professor Linda Bilmes, both of whom are American economists. The book examines the full cost of the Iraq War, including many hidden costs. The book also discusses the extent to which these costs will be imposed for many years to come, paying special attention to the enormous expenditures that will be required to care for very large numbers of wounded veterans. The authors conclude by illustrating the opportunity cost of the resources spent on waging the war. A decade after America launched its “war on terror,” Donald Rumsfeld, the irascible neo-conservative defence secretary on Sept. 11, 2001, and champion of toppling the Taliban and Iraq’s Saddam Hussein, marked the anniversary with a combative defence of the Bush-era wars. the authors present a damning indictment of the Bush administration's national security team. Obsessed with minimizing the size of the invading force, Secretary Rumsfeld dismissed advice from experts inside and outside government who argued for a larger contingent than the 140,000 or so troops sent into Iraq. His efforts "played havoc" with the military's preparations, according to the authors, and sowed the seeds for the anarchy that followed the fall of the Hussein regime. although planning for the Iraq invasion began within weeks of Al Qaeda's Sept. 11, 2001, attacks on the United States, a combination of hubris, arrogance, naïveté and sheer incompetence meant that little attention was paid to what the military terms "Phase IV," or post-conflict operations. "Cobra II" provides fascinating insights into what went wrong in the first critical weeks after the fall of Baghdad. What stands out in particular is the frustration of the military leaders on the ground with decisions taken by their political bosses. The consensus of the military leaders quoted in "Cobra II" is that these decisions, combined with the lack of enough troops to restore order, caused the United States to miss a window of opportunity and lose the initiative in the weeks following the invasion. In a reference to the insurgency that erupted in the power vacuum created by these mistakes, Mr. Gordon and General Trainor conclude that "none of this was inevitable."